Users may be removed from a Talkgroup at any time. This does not sign the user out of WAVE. It will remove the Talkgroup from the client and terminate any audio from that Talkgroup. If the User has only one Talkgroup, the client will display that it has no Talkgroups available and the User will remain signed in. Radio Subscribers removed from a Talkgroup will continue to receive and transmit with other radio units, but will no longer receive or transmit to Broadband clients. In the Talkgroups screen, mouse-over an existing Talkgroup. 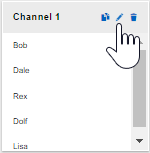 The Talkgroup changes to display all current Users assigned to the Talkgroup. Click the red check next to a User to remove that User from the Talkgroup. The User is removed from the Talkgroup. 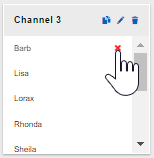 In the Talkgroups screen, mouse-over an existing Talkgroup and click the Edit icon. The editing page for the Talkgroup opens. In the Users list, all available Users for this Customer appear. Selected Users are already a member of the Talkgroup. 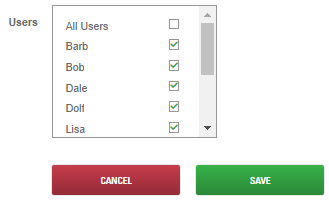 Clear check boxes to remove users and select Check boxes to add them. 3. Click the SAVE button when you are done.